Advertising on the Farming Show used to be the most expensive on the Radio Network. It probably still is because it’s now broadcast nationwide. It’s listened to by a broad audience and not just beyond town boundaries. I do an occasional spot on the show and often meet people from all around the country, urban and rural, who’ve heard me. Host Jamie Mackay has a successful recipe with a blend of farming and wider rural issues mixed with sport, music and politics. There’s a certain irony in the position I find myself in with Labour leader David Cunliffe. You see, David C has red-carded me. Meaning, for the first time since 2000, when then Prime Minister Helen Clark agreed to a weekly slot, I will not be interviewing the Labour leader on the Farming Show. Rightly or wrongly, Cunliffe says he won’t get a fair hearing, that we will make fun of him. Heck, we make fun of everyone, including ourselves. Jamie does make fun of some of his interviewees but the political segments are usually pretty straight. In fact with my ever so slightly blue bias I think he sometimes let Cunliffe’s predecessors and agricultural spokesmen away too lightly. Had Cunliffe or his media team bothered to listen to the show archives, available here, they’d have known that he’d get a fair go. I think he has unfairly pigeon-holed me. He needs to understand some of my political history before he consigns me to the National Party lackey file. . .
Brought up in a family where Norman Kirk was admired more than Keith Holyoake, Jamie voted for Social Credit in his first two elections, in 1984 he voted against Rob Muldoon and for Bob Jones, didn’t get round to voting in 1987 and had his first vote for National in 1990. Even then it was a vote more for a candidate than a party because I liked the cut of a young buck the Nats had dragged down to his home province of Southland from The Treasury in Wellington. His name was Bill English and he looked like he at least had a bit of spark in him. However, considering I’m probably in the 10% of New Zealanders who pay 70% of the tax, considering I’m a self-employed business owner with farming interests and considering I still bear the farming scars from some incredibly short-sighted, militant union behaviour in the 1970s and 80s, why would I vote Labour now? There’s nothing for me in their policies of higher tax, greater environmental and economic handbrakes for farming and re-unionising the workforce. . . . So here’s my message for PC David C, which unfortunately I can’t pass on personally. If you really want to be the next prime minister, get your teeth into some issues that affect middle and low-income NZ – jobs, education, health, and the minimum wage are traditional Labour strongholds. Attack National where you have an inherent political advantage and where it might have dropped the ball. On second thoughts, I might save that message for my new Farming Show correspondent, Dr Russel Norman. I heard Jamie a couple of weeks ago saying Cunliffe wasn’t coming on the show and he said the same thing this week. I thought he meant just those days, after all what politician would turn down the opportunity for nationwide publicity on the radio? But no, it wasn’t just couple of instances that didn’t suit his diary, he’s given the show a flat no for the worst of all reasons, that he wouldn’t get a fair hearing and he’d be made fun of. A politician who can’t stand the very gentle heat of the Farming Show isn’t going to cope with the much hotter temperature in other media and parliament. He wouldn’t have been made fun of unfairly on the show but he will be now. Jamie’s column is in the current edition of the Farmers Weekly which is delivered free to every rural mail box in the country and sold in book stores and dairies. It’s in the FW’s digital edition and on the website (to which I’ve linked above). It will be on the Farming Show website soon. I’ve already heard Jamie mention Cunliffe’s no-show and he’ll keep doing it. he’ll probably mention it to his cousin, political journo Barry Soper, who has does a spot on the show each Friday. Prime Minister John Key has a weekly interview on the show. He sometimes get a little borax poked at him by Jamie and handles it well. His customary good humour and ability to laugh at themselves will continue to provide a contrast with Cunliffe who was scared of a gentle ribbing. Deputy PM and Finance Minister Bill English, Minister for Primary Industries Nathan Guy and Deputy Speaker Eric Roy, are also regulars on the show. So are Labour’s Primary Industries spokesman Damien O’Connor and former MP now Vice Chancellor of Massey Steve Maharey. In the past former PM Helen Clark, then-National party leader Don Brash, former Agriculture Minister Jim Anderton, former MPI Minister David Carter and Cunliffe’s former leader David Shearer were all on each week. Since Cunliffe won’t front, Jamie has invited Russel Norman to replace him. All of these people are or were willing to front Jamie regularly but Cunliffe isn’t. 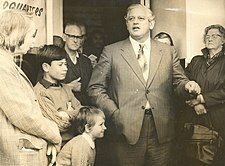 But worse than this – one of his challenges was to assert himself as leader of the opposition, a position Norman had assumed while David Shearer led Labour. Instead, he’s handed his rival a free pass to a slot that should have been his own on the Farming Show. In doing so he’s shown himself a little too concerned with his own image and a little less confident of his own ability than he would like the world to think.